I came across this wonderful blog post by one of our Flickr group members Debbie, who's blog Debbie Does Crafts is just wonderful. With Debbie's permission I have duplicated her post here.. She used a Silhouette Machine to make this lovely box. Please go leave her some love. Hope you are having a great Sunday! It is a great day for me because I get to stay home. There is a roast in the crock pot and I had the opportunity to do a little creating before I prepare for a lactation course I am taking this week. This loopy gift box is from the Silhouette store and I cut it out in white. I masked the box off and colored the loops with a copic marker. Then I cut acetate to fit behind the front panel of the box. Next to stamp around the white edges around the loops. So I used post it notes to mask the rest of the box. I covered the back panel (of the inside of the box) with bo-bunny patterened paper and adhered the words and the heart. Folded the box and glued the sides together. Thought you might like to see the entire box shape. The fold lines make it very easy to fold and shape. I used some silk ribbon around the outside of the box and pulled it up through the holes at the top of the box. Can't you see this full of silver kisses or Valentine M&Ms. You could put just a few in so the sentiment is always seen or for a fun surprise you could fill it up and they would find the sentiment when the treats are gone. Firstly I want to wish you all a very Happy New Year & hope that 2011 brings you everything your heart desires (crafty or not ;P). I don't know about you, but I am sort of glad that Christmas/New Year have passed once again. As much as I love Christmas, sometimes it does get too much. Things seem to get more & more complicated each year or is that me? Well for January's Challenge I decided that the theme should be about Time. Personally I haven't had much time for anything craft related lately. So with that in mind I want to know what tips, tricks, ideas you have for saving time whilst you craft. Or it could be a project about time ie watches, years etc. To post a photo to this thread, all you have to do is go to "the" picture , click on share this, scroll down to grab the html, then follow the directions for copy/paste. You can paste to the comment box here on the thread. It's really easy to do. You can also add comments as well. What a wonderful turnout we had for November & December's challenge. I want to thank you all for taking the time to enter. The winner for Nov/Dec is Lexike99(aka ettevyke). Congratualtions to you :D. Here is a link to Ettevyke's card - Mistletoe moment. 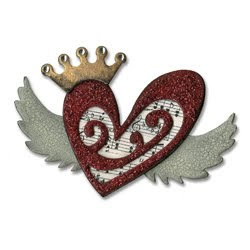 Also this is what the prize is for winning - Tim Holtz Alterations Die "Heart Wings". Thank you to every one who played along with us & please don't forget that for January's challenge you can go here. If you want to learn about a the Sure Cuts A Lot program for the Cricuit,, please visit Reliving Tomorrow. Even if you don't have a Cricuit, I think there's some valuable information there. Check out Sure Cuts A Lot at Reliving Tomorrow. You are the best, originally uploaded by joyfulstamper. 101229 Linda Christmas Joy, originally uploaded by Decoratie Coudenys - a Lut of stamps.